The European football governing body’s president Michel Platini plans to travel to Dublin to present the unusual accolade. Fans sing out during the Spain game. IT MAY HAVE been a tournament to forget on the pitch but Ireland’s remarkable support will be recognised by UEFA, it was announced today. Giovanni Trapattoni’s team were comprehensively beaten in all three of their Group C games and were sent packing as statistically the worst team at Euro 2012. However, the impeccable behaviour of Irish fans over the eight days was praised from many quarters as they captured the hearts of the Polish people. “‘The Irish! We will miss you!” was the headline in a Poznan-based newspaper after their elimination, while a German television station paid tribute to the rendition of ‘The Fields of Athenry‘, which rang out around Gdansk’s PGE Arena during the closing minutes of the 4-0 defeat to finalists Spain. The executive committee has decided to give a special award to the Irish football fans,” Gianni Infantino told a news conference in the Ukrainian capital, Kiev, on the eve of the final. Email “Ireland fans to receive 'special award' from UEFA”. 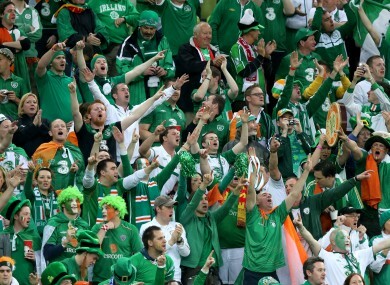 Feedback on “Ireland fans to receive 'special award' from UEFA”.